So of course, Clara is special for a very particular timey-wimey-blimey reason: she's been fragmented in time, and we already met two versions of her, who died in the far future and the 19th century. In this episode, "The Rings of Akhaten," the Doctor spies on Clara's parents' courtship and Clara's own childhood, trying to determine if there's any funny business going on with her life. What is it that makes Clara so special? The end of the episode gives us the answer: she's special because every human life is miraculous and wonderful, and our destiny can be shaped by something as small as a leaf. Yes, it's kind of treacly and ridiculous. No, it doesn't really work in the end. But it has some great moments. Anyway, as we were saying — this is the traditional "new companion sees the universe and proves that she's SUPER GREAT" episode. 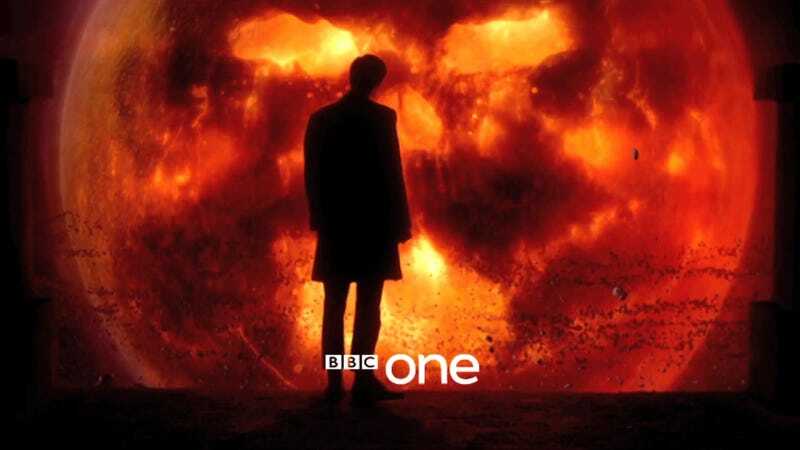 The first 15-20 minutes felt like a retread of "The End of the World," where the Doctor introduces Rose to a bunch of aliens, and then Rose goes off and meets a humble cleaning woman and they bond over being working stiffs. Bits of it also reminded me quite a bit of "The Beast Below," Amy Pond's sophomore story, in which it's Amy who saves the day while the Doctor is stymied and shouty. In this story, Clara saves the day because she has the humble (and amazingly well preserved) leaf that blew into her dad's face, nearly causing him to die in a traffic accident and causing him to hook up with Clara's mum. Hence, the leaf is "the most important leaf in human history," if you take a rather Clara-centric view of humanity. That leaf was in the front of Clara's book about places to see, which was a hand-me-down from her late mother, who died in 2005 when Clara was still quite young. She offers it up to a parasite god thingy, whose nature is left vague (probably for the best) but who feeds on memories and stories and songs and stuff. Clara's leaf overloads the parasite god thingy, because it contains not just all the stuff that actually happened with Clara's mum and dad, but all the stuff that never happened because Clara's mother died too soon. This unrealized potential is like monster ipecac. Before that, the Doctor has been having one of his shouty moments, snarling at the creature about all his amazing memories and all the things he's seen and the secrets he knows, etc., etc. — the Doctor expects all this stuff to give the creature indigestion, but it's not enough, until Clara shows up with her magic leaf. This sort of builds on something earlier in the episode, where they need an object with emotional significance to pay an alien for a flying moped, and the Doctor has nothing except his sonic screwdriver. All of these years of traveling, and the Doctor has nothing to show for it, that compares with Clara's memories of her mother. So how do we get to this point in the first place, where the parasite god is woken up and demanding to devour people's souls/stories/songs? It's kind of unclear. There are a bunch of planets circling a star, where they believe all life in the universe originated, and they gather for a big festival where the Queen of Years, who's a small blonde girl, offers up a song that contains all of the histories and memories of these worlds to Grandfather, which is the "alarm clock" for the giant parasite god. The first 15 minutes or so of "Rings of Akhaten" are note perfect, and represent Doctor Who at its best — the giddy fun of visiting a whole new world and meeting lots of aliens is great, and the sheer number of random aliens wandering in and out of frame feels sort of like the Cantina scene. Matt Smith is at his most charming, showing Clara around a whole new world and introducing her to strange customs and weird sights and sounds. And if the goal of "Rings" is to cement the sense that Clara is "OMG awesum" as a companion, then the bit where Clara winds up on her own and meets a small girl in distress is perfect as well. She's way out of her element, but she still looks after the Queen of Years and keeps her hidden from her pursuers, then bonds with her over a time when Clara got lost and felt scared. Jenna-Louise Coleman is terrific in these scenes. It's only after the Queen of Years does her song, and it somehow fails to pacify Grandfather, that the episode starts to go a bit off the rails. Although the stuff where the Doctor and Clara race to the Queen of Years' rescue is nice, I sort of lost the thread of what was supposed to be going on here, even after watching it a few times. Did the song fail? Did Grandfather just decide that this time around, he'd like a human sacrifice in addition to the song? It's not clear — the Doctor says the song didn't fail. But people seem simultaneously shocked and not at all surprised that the Queen of Years is being turned into a human sacrifice. The Chorister is terrified, and then he's resigned. The whole thing feels like we've ventured so far into abstraction, we've lost the thread somewhat. But in any case, the episode starts off asking why Clara is so unique, and winds up telling us that everybody is unique. As the Doctor explains to the Queen of Years, we're all improbable conglomerations of molecules from distant starts, we're all a fleeting miracle, and so on. And none of us can be sacrificed. We don't get any resolution on the actual question of how Clara can have lived three different lives, however. And there's a moment that rings horribly false at the end of the episode. Clara suddenly realizes the Doctor was there, spying on her mother's funeral. The Doctor explains that she looks like someone else he used to know, and instead of being horribly creeped out or demanding answers, Clara just asserts that she won't be a "bargain basement" replacement of anybody else. Which gives the Doctor a chance to announce, once again, the episode's theme: that Clara is special because she's Clara, and that she's the one who saved the day. Look! A shiny ring! Stop asking questions! All in all, when the episode focuses on making Clara feel like a real person, with actual emotions — like in the scenes where she's protecting and comforting the Queen of Years — she actually feels like she deserves to be a companion. When the episode tries to put up a billboard with letters ten feet high explaining that Clara is Super Special, it feels like it's reaching somewhat.